Wade Gamblin received modifications to his home from Habitat for Humanity of Smith County, an administrator of the TDHCA Amy Young Barrier Removal Program. *Note – Home modifications to increase accessibility for persons with disabilities featured in the article below were made possible through a one-time grant from the Amy Young Barrier Removal Program (“AYBRP”) administered in Lindale through Habitat for Humanity of Smith County. LINDALE – The machine in the corner of the room let out a series of beeps as two numbers - one red, the other green – flashed on the screen. “That’s not good,” registered nurse Sandra Weller said as she eyed one of the numbers reaching into the 120s. Seventeen-year-old Wade Gamblin lay in the bed, silent, yet alert. Wade’s heart rate could rise for several reasons, including pain or not getting enough oxygen. Weller had already been concerned that morning because Wade seemed sick. 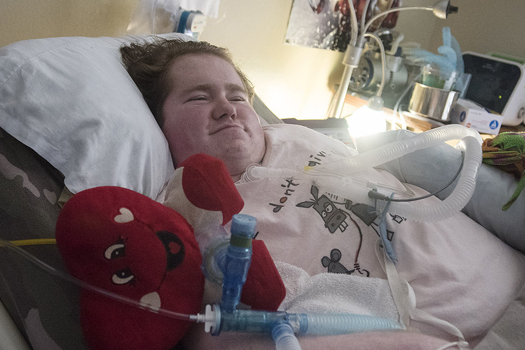 As a quadriplegic who relies on a ventilator to breathe, his lungs can get infected. His nurse had already scheduled a doctor’s visit because of his symptoms and, as his heart rate rose, she called the ambulance service. “I need a transport,” she said to the person on the other end of the line. Wade has to be transported to the doctor by ambulance for every visit. A little more than a week ago, this transport would have been almost impossible. The problem was the sidewalk at his parents’ house in Lindale was too small and required the paramedics to maneuver Wade on a gurney around a sharp L-shaped turn from the front porch to the driveway. More than once, Wade had almost fallen off the gurney when the paramedics were trying to get him from the house to the ambulance. The ambulance company notified Wade’s parents, Henry and Alice Gamblin, that unless the problem was fixed, they would have to discontinue service because of liability and patient safety issues. Enter Habitat for Humanity of Smith County. When the home health care company that helps care for Wade realized the situation, they contacted Habitat. And through the nonprofit agency’s ReHabitat program, which repairs homes for senior citizens, veterans and people with disabilities, the Gamblins got an additional sidewalk that curves from their front porch to the driveway making Wade’s medical transport possible and safer. However, the sidewalk was just a first step. Though the Gamblins weren’t asking for help, once Raimund Gideon, Habitat’s director of construction, got out to the house, he talked to the family and realized their situation. Because Gamblin is a veteran - he served for several years in the U.S. Navy - and Wade has a disability, that opens doors to other sources of revenue Gideon can use to make the family’s life easier. The funding sources include the Texas Veterans Commission and the Texas Department of Housing and Community Affairs. The nonprofit agency used its own money to add the sidewalk. Though the house’s overall condition is good, the air conditioning was struggling and actually broke recently. In addition, there are some design issues that create challenges when caring for Wade. For example, Wade’s room is near the front of the house, but it has no bathroom in it. That is fine on the one hand because Wade does not use a toilet. However, it means there is no way for his caretakers or family to bathe him. He gets washed through sponge baths because he can’t be carried to and from a bathtub. Gideon envisions using grant funds to create a new room for Wade off of the back of the house and connecting it to the existing master bathroom. He would then install a lift system that could carry Wade from his bed to a bathtub, so he could get an actual bath. The family is grateful for the improvements made with the new sidewalk and air conditioning and the ones that could come. The Gamblins are on their second round of parenting. Henry is 74 and Alice is 68. Wade and his sister, Cheyenne, 14, are their biological grandchildren and their adopted children. They have raised them most of their lives. They have five adult children as well. Wade was 12 when he contracted the West Nile meningitis, a more severe form of the West Nile virus. The infection put him in a coma, and he was given experimental drugs at the time. When he got “well,” he was no longer the same child. He was a quadriplegic. He has a tracheostomy tube, breathes with a ventilator and is fed through a feeding tube. He cannot speak, though his father said he understands and mentally is capable. His family has developed a form of communication where sticking out his tongue means yes and closing his eyes means no. Home health nurses work 12-hour shifts, and one or both of his parents, who are retired, always stay at the house. Still, there is joy in the household. Family photos are displayed throughout. Mrs. Gamblin shows some photos of Cheyenne and Wade with filters so they have animal ears and noses. Though Wade may not be able to verbalize his likes and dislikes, his personality and sense of humor come through in the decorations around his room. Posters of the “Avengers” and Angry Birds hang from the walls as do a bunch of emoji plush pillows. But there’s another side of life that’s not so fun. Dry-erase boards hang on the wall covered with phone numbers and medical information. An over-the-door shoe organizer serves as a storage container for medical supplies. Still, nearby are more posters, “Duck Dynasty” figures and prank toys. Wade is a teenage boy, albeit one with a lot more health challenges than the average person. One of the big risks for Wade is pneumonia, which his nurse recently was concerned he might have. Two times a week, a physical therapist comes to work with Wade. He regularly works on sitting up, lifting his head and has to get into a device that stands him up. A teacher also comes to the house to work with him. Though he doesn’t go on too many excursions outside the house, his family does use a wheelchair to bring him into the living room often. His sister, Cheyenne, often helps with his health care needs and knows how to do most things including change his tracheostomy tube. She wants to be a nurse, her father said. Though the family’s normal routine includes situations most people struggle to imagine, they approach life with resolve and love. * The Amy Young Barrier Removal Program provides one-time grants of up to $20,000 for Persons with Disabilities who need modifications to increase accessibility and eliminate hazardous conditions in their home. The program, funded through the state Housing Trust Fund administered by TDHCA, provides grant funds to nonprofit organizations, such as Habitat for Humanity of Smith County, and units of local government to assist persons with disabilities to make homes (rental or owner-occupied) more accessible. If you or someone you know needs similar assistance, please visit our Help for Texans page to find a local provider. If you would like to administer this program to others in your community, please visit our Notice of Funding Availability (NOFA) page for current opportunities.